Technology is everywhere these days, and, in many ways, it's helping us all live better lives—whether we recognize it or not. So many areas of our lives are affected by technology, from the gadgets in our household (and the way they were made, with factories employing robotic help), to the stores we visit, and the way we communicate with one another. Although there can sometimes be a dismissive attitude about older adults and technology, it's really no different with this age group. There are many ways in which technology is helping elders to live better lives—and to make them safer, as well. Social service agencies are taking note of technology's power and employing it in ways that help protect older adults. The Jewish Association Serving the Aging (JASA), one of New York's oldest agencies serving elders, recently adopted a new technology that enables JASA-trained social workers (and other nonattorneys) to spot legal issues related to exploitation. This new tool will also help identify needs among their homebound and clients with disabilities. In this way, technology is being used to help keep elders safe on a greater level than ever before. The risk assessment tool JASA employs helps perform screening and referral activities—and in turn, more comprehensively identifies and addresses the legal and social service needs of clients, says Donna Dougherty, JD, attorney-in-charge at JASA/Legal Services for Elderly in Queens. "Through the screening website, JASA social workers conduct legal health check-ups for homebound older adults on consumer debt, eviction, and financial exploitation by checking off those statements in the tool that apply to the client, an example being 'Someone has been asking me for money,'" Dougherty explains. "Based on the answers, the website assigns a level of client risk—very low, low, moderate, high, very high—and a detailed report is simultaneously e-mailed to the lawyer for review and follow-up." Amy Chalfy, LMSW, chief program officer for JASA, says that, generally speaking, technology can most certainly play a role in assisting social workers in protecting their clients. "Technology, like the risk detector, helps identify client needs and risk so that early intervention and prevention steps can be taken," Chalfy says. "For social workers who are in the field, it also allows access to files and needed information without having to be physically in their office. And it allows social workers assisting isolated and homebound clients to access needed agencies such as the courts that, without such technology, remain out of reach for many clients." While technology being employed by social service agencies and social workers themselves is powerful, so is technology in the hands of elders. Alex Glazebrook, MSW, director of technology and training for Older Adults Technology Services (OATS), an organization headquartered in Brooklyn that engages, trains, and supports older adults in using technology to improve their quality of life and enhance their social and civic engagement, says it's not so much about the technology itself as it is about what technology can enable people to do. And there is no reason why older adults should be excluded from those possibilities. "We believe strongly that society perpetuates this stereotype that people cannot use technology as they age," Glazebrook says. "That's simply not true. In fact, we like to say 'look what technology can do for people as they age.' There are so many benefits." But Glazebrook says that society continues to stand in the way and is perhaps the biggest barrier to more older adults adopting technology and using it more readily. Glazebrook says that even classes that are meant to teach elders how to use technology can be disparaging toward them. "Older adults come in to take a class, and they are often taught with this elementary school approach—it's a turn-off to them," Glazebrook says. "But at OATS we really apply a lot of adult learning theory principles. We value the experience that older adults bring to the table and we meet people where they're at." He adds that the media can sometimes also play a role in perpetuating some of these negative stereotypes, creating a stigma that older adults find difficult to detach from. "If you look at the ways in which the media frames older adults and their use of technology, it's always a frail elder and they often look confused," Glazebrook says. "I think we've created this environment where people assume that technology is not relevant to people as they age—and even older adults have begun to accept this general idea. They buy into the stereotype. But it's not true." There are many reasons why it's important for older adults to keep up with technology. Mike Meikle, CEO of secureHIM, Inc., a firm dedicated to changing the security culture of health care through implementing health information technology security training, education, and assessments, says that older adults can get left behind in this increasingly digital world—particularly when confronted with modern support systems that can only be accessed via technology. "For example, older adults who lack technological familiarity can find themselves at a loss when applying for benefits or navigating their various care options," Meikle says. "This necessitates the need for older adults to at least become familiar navigating online tools via a web browser." In general, health care is increasingly moving toward more technology implementation, Glazebrook says, and that creates a big need for older adults to learn these valuable skills. "You cannot expect an older adult to confidently walk into a doctor's office and enter their information into a tablet—but many practices are moving in that direction," he says. "Many older adults do not have the basic literacy skills to do that. And that's a problem." Fortunately, Meikle says, over the past five to 10 years, technology has become much more user friendly for those who have no technology background, and that's helped a bit. Still, Meikle says there is a lot of opportunity for social workers to help older adults become more familiar with technology by referring them to education opportunities or even assisting them. Education is exactly what OATS provides. Glazebrook says that many of the classes don't start right off the bat with technology interaction but that they'll often ease into it. Instead of saying, "We're going to learn about copying and pasting today," Glazebrook says that they may talk about other topics first. He says this approach has worked well in preventing older adults from getting turned off. After all, it can be overwhelming for anyone to learn something new. While there is certainly an increasing need for older adults to adopt technology skills, Glazebrook says there is also a need for more social workers to embrace technology. As a field, social work has lagged behind other professions when it comes to keeping technology skills relevant—and there may be opportunities that are missed as a result. Just as JASA is taking advantage of implementing technology to keep older adults safe, there are many opportunities for other social service agencies to follow suit. 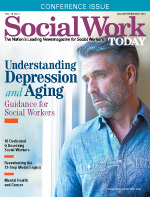 "Technology can benefit the field of social work in many ways—but primarily by making it more connected," he says. "As we progress in this digital age, there is no longer a need to carry around paper files, as all of that information can be digitized. And one organization can be connected to another so that there are no gaps in client care." Unfortunately, Glazebrook says, he believes technology is still underutilized in direct care settings and it's certainly underutilized in aging services. "There are so many applications that can make your program more robust simply by using technology," Glazebrook adds. "In other words, technology opens doors that social work isn't exploiting to the extent it should be. It's time to change that."